The time taken to weeding is the one that quite a lot of the efficiency is controlled by the performance of the weeder (grass mower and brush cutter) in the farmer in the part between Nakayama among work during year. It is not an exaggeration to say might weed of the same part necessary several times within one year, and weeding all the year round excluding winter. We were a convenient thing like the grass mower, and were the hand all work with the weeding sickle in childhood. There is a convenient grass mower now, and efficiency is times how many different from old times. I want to describe the point noticed in having weeded for years though weeding is not good one. 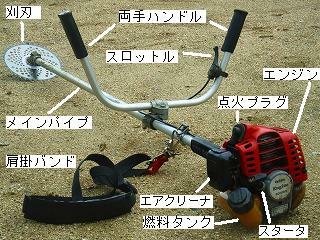 The name of each part of the grass mower and How to use. This photograph is a brush cutter that I am using. It has not worried about the manufacturer so much. Because I have not bought the brush cutter. The reason for father is that the new article is always bought straight actually when the condition of the brush cutter worsens as for it. The engine has the thing of two cycles and the thing of four cycles. Four cycles seem not to consume gasoline though the cheap one is two cycles. It has been the previously adhering of the blade from the engine through the main pipe. The protection cover of the blade had adhered originally forward. Because the grass coils when a long grass is cut when this cover exists and efficiency falls very much, the cover is removed. An automatic centrifugal clutch has adhered from the engine between the main pipes, and the rotation of the blade stops automatically when the rotation of the engine is dropped. In the main pipe, there is a band that hangs it by the shoulder. Moreover, there is a knob that supports it by both hands near there. If both hands are not used in the prolonged activity, it becomes tired though there is a model without the knob either. As for the position of the band that hangs with the shoulder and the position of the knob, a good position is different because of the physique. Therefore, it uses a mower and it adjusts it at an easy-to-use position. The one with the stop switch adjusts the switch to the position of the start. The throttle lever is adjusted to a low-speed position. Additionally, there is something with the lever of the start according to the manufacturer and the model. Gasoline is sent to the vaporizer until the fuel returns from fuel return pipe to the fuel tank pushing a primary pump several times. The star tag lip is pulled several times while firmly holding the main body by the hand until the explosive sound of the engine is. When the first engine explosion sound is heard, the chalk lever is returned to the position of "Open". The engine starts easily when the star tag lip is pulled again. 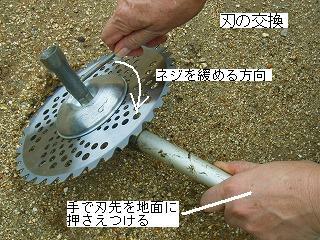 A left photograph is chip saw used for the brush cutter It is a macro photography in the tip of the blade of (There are 230mm in the diameter and 255mm). 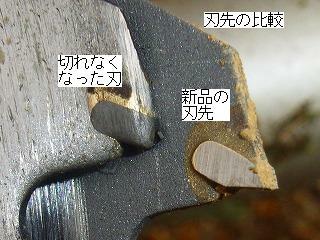 It is a comparison of tips of the blade to which the new article and sharpness drop. The efficiency of work falls very much because it pulls and it tears up the grass by force when becoming it like this. Moreover, the consumption of the fuel increases, too. Blades are exchanged ahead of time. There are the one that it is not necessary to sharpen the blade like tip-saw and the one that it is necessary to sharpen the blade that includes 2-8 blades in saw blade of the brush cutter. In the one to sharpen the blade, the center of gravity of the blade might move to wear out of the blade while using it, and the vibration become intense because of the rotation. There are a thing of 230mm in the diameter and a thing of 255mm in general tip-saw. You will use both things with a small diameter in the grass mower with small power of the engine (engine displacement 20-25CC) in the one of the engine type though it is possible to use. Moreover, when grass fat, hard, the plant length long, and the bamboo and tree are cut, the thing with a small diameter is used. When power large of the engine (engine displacement 26-45CC), and soft grass are cut, I think that I can efficiently cut one with a large diameter of tip-saw. You will decide it actually cutting it. Safety glasses are used without fail. It is likely to fly by lacking the chip of sand, a small stone, and the blade when the brush cutter is used. It is very dangerous without glasses. Clothes wear long-sleeved shirts and long trousers, and shoes put on the gum boot. The hat and gloves are worn without fail. The purpose of this is to protect the body and it is very important. Especially, the gum boot is indispensable to defend bodying from the pit viper (venomous snake). It doesn't run away at once even if the person approaches as pit viper's habit. It doesn't run away easily even if the sound of the grass mower is heard. When the grass is sequentially cut from the edge short, the pit viper is often cut with the blade. It is noted not to enter the grassy place suddenly. Oiling or grease is injected into the part where the grass mower moves mechanically. However, do not put up oil to an automatic centrifugal clutch. The mixed oil is used for two-cycle engine. It makes it to a humidity mixing ratio specified of the manufacturer. Generally, the engine oil and gasoline are mixed with the ratio at 1:20-1:50. When not understanding well, the ratio is 1:25. A small stone of the place where the grass is cut is removed beforehand. The number of small stones decreases gradually when a small stone is picked up every time after weeding because this work is difficult before cutting the grass. Weeding the place without a small stone at all is very comfortable. saw blade also lasts long. The place where a big stone has been exposed covers with the soil or it divides and the stone is removed. It is also important to check whether the bee is doing the nest to the place to which it weeds. Especially, there is danger of the life when approaching without knowing the position of the nest because the vespid might build the nest in the soil. It works always taking care not others' entering for near as working. Cutting when the tip of the blade is moved from the right toward the left because the blade is a left rotation when the grass is cut advancing is good efficiency, and because the kickback is not generated, safe. When storing it without using the grass mower for a long term, the fuel in the tank and the vaporizer is emptied. Otherwise, the jet where the vaporizer of the engine is thin might be blocked. The rotation part and the moving part are oiled, and grease is painted. Because I am using it until the fuel always disappears, it stores it as it is. A dry cool dark place is the best for the place where the grass mower is kept. The worst one is a place where direct sunshine strikes, and rain hangs. It is early that various parts are deteriorated because of ultraviolet rays and moisture. The feature of the nylon code and How to use. The nylon code is called a nylon cutter. A hard grass doesn't cut though the nylon code is different from a metallic blade and a soft grass cuts. Then, the nylon code is advantageous in the place where a lot of stones exist and the place where a lot of obstacles exist. When it is a nylon code, it is possible to cut it well for weeding to cut the grass many times necessary, and short under the electrified fence etc. , and to damage the prop in the electrified fence. Oppositely, cutting a hard grass, the bamboo, and the tree by the nylon code becomes difficult. A long grass becomes difficult in the nylon code, too. The probability that a small thing scatters compared with a metallic blade rises very much at work by the nylon code. The defended cover is indispensable. Moreover, safety glasses are also indispensable. I think that the thick one is good of the pair of trousers. Because the grass mower is anti-clockwise, how to roll the nylon code is rolled clockwise. The rolled nylon code gets loose and it dashes out when the nylon code is anti-clockwise rolled. The nylon code becomes hard due to the cold if the nylon code is used in winter, and it is seems to cut easily. It lasts long in summer. It can be efficiently cut to raise engine revolutions when weeding by the nylon code. Therefore, I think that the power of the engine should be large. 25CC or more of the engine displacement of the engine of the grass mower might be better.